In the early morning, on Thursday, November 22nd, 2018, a tipistola was erected on the entrance to the John A. Blatnik bridge in Superior, Wisconsin. Eight poles were used to represent the four directions that blocked the entrance to the bridge. 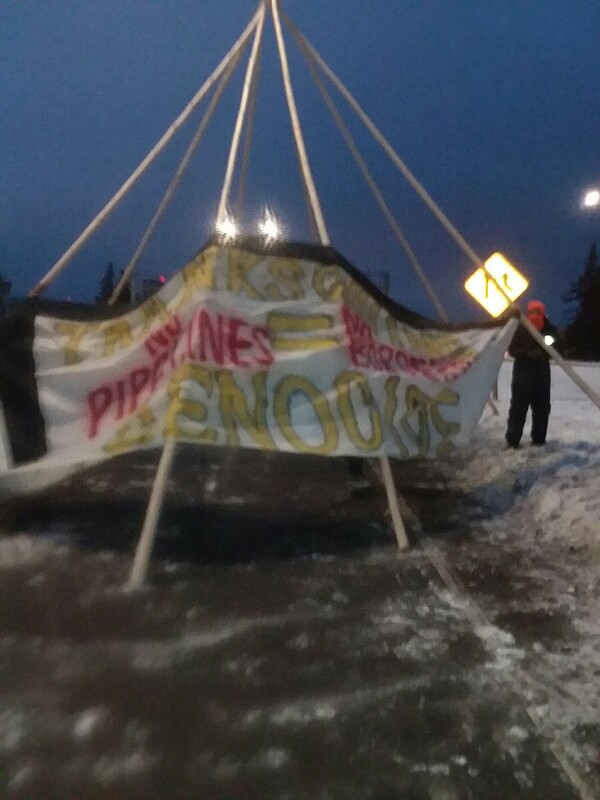 This blockade erected represents not allowing Enbridge and their new Line 3, as well as other forms of racist resource colonialism from entering so called “Minnesota”. 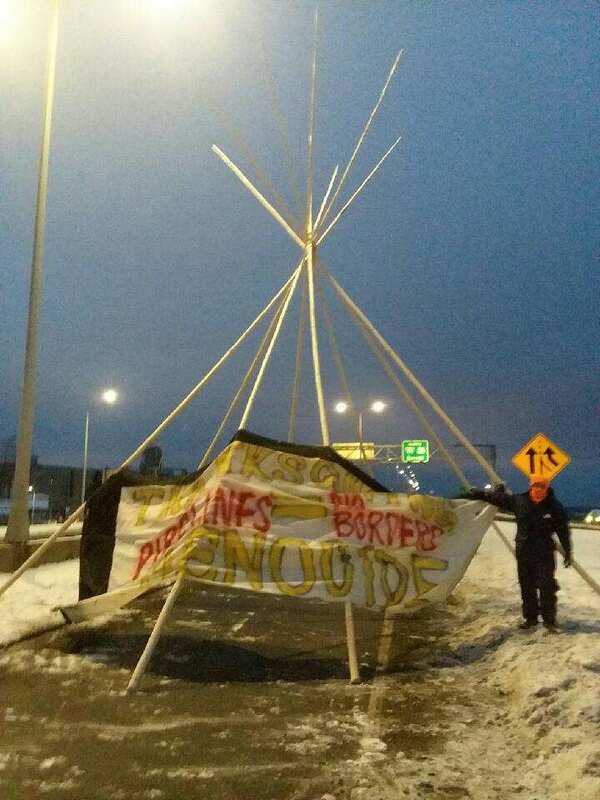 A banner was draped across the front of the tipi and it reads “Thanksgiving = Genocide”, as well as “No pipelines, No Borders”. “Today, we take action to honor the millions of indigenous people who were murdered by settler colonialism. We have an obligation to stand up for what is right and acknowledge our ancestors who sacrificed for us to be here today.” says an Anti-colonial Land Defense member as the tipi goes up. Many know this day as “Thanksgiving” which is observed the 4th Thursday of November. The story behind the observed holiday is not the story told in history books. The Mashpee Wampanoag were the 1st Indigenous people to find the English pilgrims starving at the shores of what is now called Massachusetts. Fast forward less than 400 years and the descendants of Indigenous people who taught the European refugees how to survive in so called “America”, are now at risk of losing control over lands they consider home, the lands they have lived on pre-colonization. The thanksgiving story is problematic because it is a fallacy; the truth is that in 1637 near present day Groton, Connecticut, over 700 men, women and children of the Pequot Tribe had gathered for their annual Green Corn Festival. In the predawn hours the Indigenous people were surrounded by English and Dutch mercenaries who ordered them to come outside. Those who came out were shot or clubbed to death while the terrified women and children who huddled inside the longhouse were burned alive. The next day the governor of the Massachusetts Bay Colony declared “A Day Of Thanksgiving” because 700 unarmed men, women and children had been murdered. The current administration, (as all colonial administrations before) threatens tribal sovereignty and vigorously undermines treaty rights, Indigenous rights and environmental concerns that ultimately will be our demise if we continue to let our truths be silenced by their genocidal acts of mass assimilation. We do not need a fascist regime occupying indigenous homelands to uphold their end of the treaty or swear by the bible in a fictitious setting like a court room to live the way we always have pre-contact. Bringing our concerns for our lives, water, lands and the future generations to their colonial injustice system places the ball in their court. From the colonial heteronormative patriarchy, to racist resource extraction, to the epidemic of murdered missing indigenous womXn, we continue to see the foreign systems that’s have oppressed our people since 1620 when a “migrant caravan” crossed the ocean searching for “freedom” and “prosperity”. We can see first hand in our communities the atrocities that have taken place causing multi-generational trauma, the continuous Indigenous erasure and white washing of history, and the oppression that takes place to this very day. Yet, still we also see resilience, strength, and compassion in our communities. Our cultures, ceremonies, and languages continuing regardless of the tactics used by the “united snakes of ameriKKKa”. We have been here since time immemorial, and our migration routes all across the western hemisphere were established long before European settlers arrived on these shores. We stand in solidarity with our Quetzal & Condor relatives from Central and South America, who are migrating North for whatever reason it may be, because they deserve access to their homelands. Many of the Indigenous peoples lineage comes from south of the Imaginary Border of the United States Government. We ask that you educate yourselves on whose ancestral homelands you benefit from and live on, find out ways you can become a better ally for indigenous people and their causes, and stop celebrating holidays that are based on genocide of Indigenous people.